“Girl Crush” wins Song of the Year. 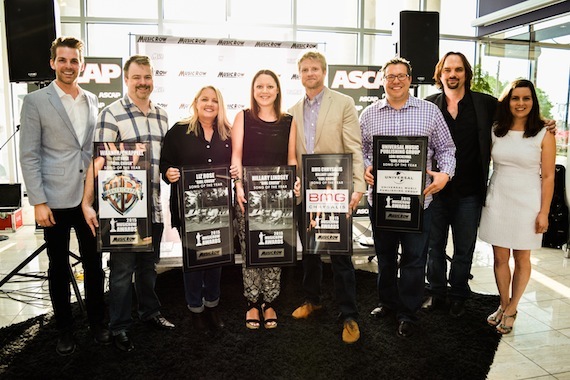 Pictured (L-R): MusicRow‘s Eric T. Parker, Warner/Chappell’s Ben Vaughn, “Girl Crush” songwriters Liz Rose and Hillary Lindsey, BMG’s Kos Weaver, Universal Music Publishing Group’s Kent Earls, and MusicRow‘s Sherod Robertson and Sarah Skates. Not pictured: co-writer Lori McKenna. Photo: Bev Moser. This year’s MusicRow Awards party had exceptional hospitality, a happy vibe and, most of all, a pervasive feeling of conviviality and comrade-ship. “There is nothing like doing what we do, and doing it with our friends,” said songwriter Liz Rose. “This is my family, basically,” said songwriter Michael Carter. 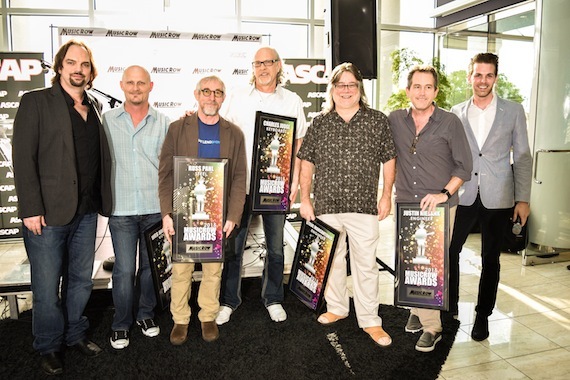 This year’s event was staged at ASCAP on Tuesday evening (6/23). ASCAP’s Mike Sistad greeted the crowd and brought MR’s Sherod Robertson to the stage. Among the stars who won their early industry awards from MusicRow are Blake Shelton, Kacey Musgraves, Lady Antebellum, The Band Perry, Chris Young, Joe Nichols, Phil Vassar, Luke Bryan and the Zac Brown Band, as well as Swift. Here’s hoping this year’s honorees follow in their footsteps. 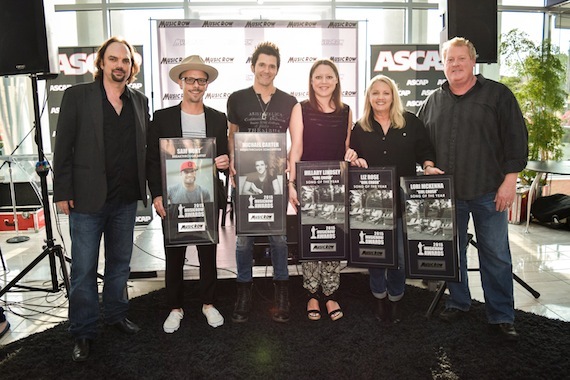 Thanks to his work with Eric Church, Little Big Town, Brothers Osborne and Cage the Elephant, Jay Joyce won his first Producer of the Year award. “He promises he will continue to push the envelope for our town,” said Melissa Spillman, accapting on Joyce’s behalf. Neon Cross’s Melissa Spillman accepts Producer of the Year on behalf of Jay Joyce. 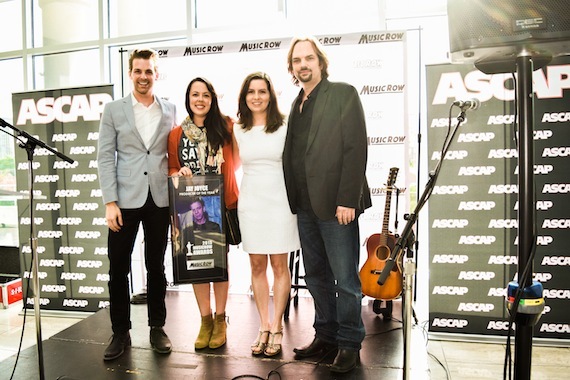 Pictured (L-R): MusicRow’s Eric T. Parker, Spillman, and MusicRow’s Sarah Skates and Sherod Robertson. Photo: Bev Moser. Sam Hunt’s win as Breakthrough Artist was something of a surprise, since Swindell has been cleaning up in this area lately. “This guy has that IT factor,” explained Robertson. “He’s the happiest artist I’ve ever seen in my life,” said Belanger. “We’ve got some cool stuff on the road ahead.” Hunt had just one day off this week to move into his new house, and this conflicted with the ceremony. Song of the Year co-writer McKenna lives near Boston and was also a no-show, but her “Girl Crush” collaborators were delightful at the mic. “This is so fun,” said Liz Rose. “Everybody’s been so awesome to embrace this song.” Added co-writer Hillary Lindsey, “It’s a pretty cool thing in this town and with this song.” Rose and Lindsey took the stage to powerfully perform “Girl Crush” as the event’s finale. 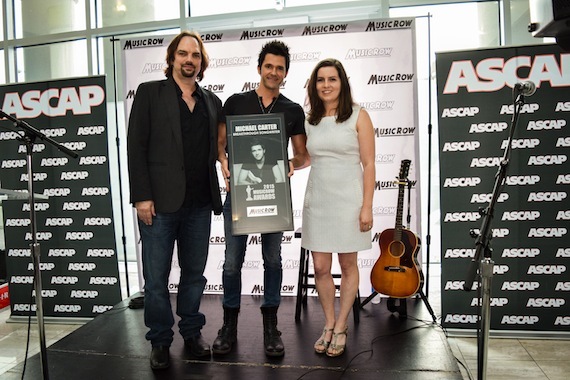 Breakthrough Songwriter is presented to Michael Carter (center) with MusicRow’s Sherod Roberston and Sarah Skates. Photo: Bev Moser. 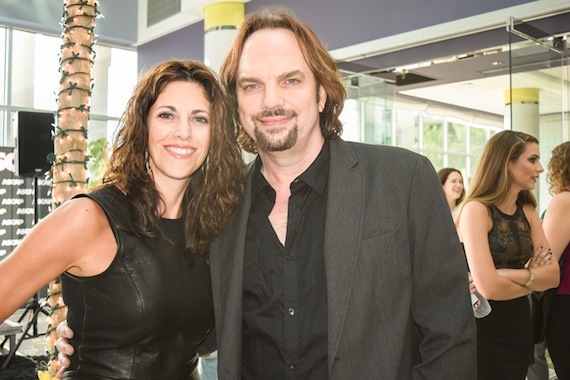 The MusicRow Awards is the only industry event that honors Music City’s session professionals. This year, everyone who won last year was a repeat winner, with the exception of first-time honoree Steve Marcantonio, who tied as Engineer of the Year with 11-time prior winner Justin Niebank. Background vocalist Wes Hightower won his category for the thirteenth time. “I’m thankful for every single one of them,” he said. Aubrey Haynie won his eighth fiddler award. Ilya Toshinsky won his sixth guitar honor. Keyboard player Charles Judge earned his fifth award. “Thank you, MusicRow, for doing this,” he said in appreciation of the magazine’s musician recognitions. Jimmie Lee Sloas won his fifth bass player award. Drummer Greg Morrow won his fourth. Steel player Russ Pahl earned his second. Dave Pomeroy of the Musicians Union was proudly snapping photos. Also working the room were Randi Perkins, Randall Himes, Bobby Rymer, Bob Doerschuk, Dale Bobo, Eric Paslay, Eric T. Parker, Erika Wollam Nichols, Susan Collier, Suzanne Lee, Charlie Monk, Chuck Thompson and Alison Toczylowski (who has recently married and plans to adopt a shorter last name, Webber). ASCAP’s hospitality could not have been lovelier. Chef Michael Mirriam whipped up barbecue sandwiches, chicken satay bites, hummus & pita chips, Italian sausage slices, veggie plates, ham sandwiches, cheese & cracker samplers, blueberry & watermelon medley, salsa & chips, spiced meatballs and cucumber sandwiches, not to mention desserts. Byron Gallimore, Barry Coburn, Ben Vaughn, Bev Moser, Beth Gwinn, Bill Wence, Becky Harris, Brett James, Carey Barlowe, Celia Froehlig, Cyndi Forman, Doug Johnson, honored guest U.S. copyright registrar Maria Pallante (I told her we threw the party just for her), James Elliott, Jessica Nicholson, Kos Weaver, Kent Earls, Kelsey Grady, Pat Higdon, Ryan Hurd, Rusty Martin, Rich Fagan, Sarah Skates (with her adorable family), Sherrill Blackman, Tracy Gershon, Troy Stephenson and Woody Bomar enjoyed themselves and the event.